← 2 Peter Pt. 9 – Sermon Notes / What Am I? The recovery of the realization that as individuals we’re are born alienated from and enemies of God, and the need for reconciliation to Him through faith in the atoning sacrifice of Jesus Christ on Calvary. But with that recovery, can come a danger: The thought that salvation is entirely personal and individual, leaving out the aspect of the fullness of Christ’s redemptive work in the whole of the cosmos, ant JUST the individual. Our study in 1st and 2nd Peter reminded us of that aspect in looking forward to Christ’s return, but backing up to see this more particularly might be of real help. That is where I hope to go this week and next – God willing. God is a God of order: Creation displays it everywhere. You cannot read the 1st 3 chapters of Genesis without seeing over and over how it is God is meticulous in His arrangement of things – both in terms of the natural creation and beyond. The word most often translated “WORLD” in our Bibles is the word “kosmon” = which means an order or arrangement. We get our word cosmetics from it – to adorn and put in right order. When God created the physical universe, He did so bringing everything into a certain order – an order which demonstrates proper relationship between things higher, things lower, and things equal. Kuyper: Sphere Sovereignty’ (1880) – God ordained distinct domains of being and action. Each has its own area of delegated sovereignty or authority, which is not to be violated by others. If each one stays in its own area without trying to meddle in other’s – HARMONY! When this breaks down – DISASTER! And it doesn’t take much. The more delicately and precisely things are made, the more one little thing out of order impacts the whole. “Let’s eat grandma vs. Let’s eat, Grandma”. 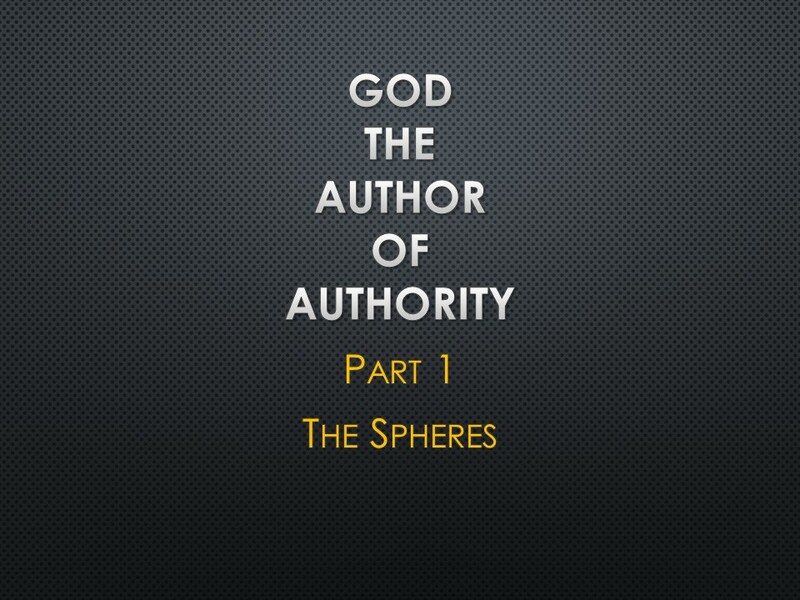 The Bible sets out a number of these “spheres” most often by incorporating the word: “OBEY”. Someone or something has a responsibility to obey someone or something else. This is the structure of Authority & Submission or obedience. Spheres may overlap some – but each has its ordained responsibilities from God. I want to try and unpack the big concepts about God’s order in Authority this morning, and then bring it down to the practicality of it next week. So bear with me. SPHERE 1. God & His will (Commandments) culminating in Christ Jesus. God’s authority is absolute – none can challenge it. And all the others derive their authority from His appointment. In creation, all of physical creation simply comes into being and responds to His voice: “And God said”. i.e. He willed it, and it was so. As Creator, He has absolute rights and authority over His creation(s). We need to note here that since God alone has absolute authority, all others are not only derivative, but limited. We’ll see what that looks like as we move on. It’s sufficient to say here that no one in any sphere has the right to require anything of anyone else that is contradictory to God’s commands and rights. No one can require anyone else to do anything that is immoral, illegal, contrary to their conscience or unjustifiably dangerous – war might require justifiable commands to enter into danger. But this is never at the mere whim of another. It is under the larger structures. SPHERE 2. Nature: Created order. Man & 2 ideas. Adam shows his authority in naming the animals, and then is given a wife who is his equal, and yet he names her as well. So there is an order set up in the home from the very beginning. Man as PART OF AND UNDER nature – Romans 1:18-27 We’ll come back to this next week, but at the very least we learn in this passage that when we as human beings under God’s authority, try to circumvent the sphere He ordained in nature – there is always a price to pay. So it is no one can safely defy the law of gravity or of inertia etc. No one can live apart from food or water or air. Nature has its God given laws and we are bound by them. SPHERE 3. Home: Parents (and designees), husbands and wives in order among equals. SPOUSES: Eph. 5:22-24 Wives, submit to your own husbands, as to the Lord. For the husband is the head of the wife even as Christ is the head of the church, his body, and is himself its Savior. Now as the church submits to Christ, so also wives should submit in everything to their husbands. Col. 3:18 Wives, submit to your husbands, as is fitting in the Lord. CHILDREN: Eph. 6:1-4 Children, obey your parents in the Lord, for this is right. “Honor your father and mother” (this is the first commandment with a promise), “that it may go well with you and that you may live long in the land.” Fathers, do not provoke your children to anger, but bring them up in the discipline and instruction of the Lord. SPHERE 4. Governments & Civil authorities: We see this emerging especially after the Flood, which came about at least to some great degree due to the fact: Gen. 6 – Each man was simply following the dictates of his own evil intentions. Later we are told: Romans 13:1–7 Let every person be subject to the governing authorities. For there is no authority except from God, and those that exist have been instituted by God. Therefore whoever resists the authorities resists what God has appointed, and those who resist will incur judgment. For rulers are not a terror to good conduct, but to bad. Would you have no fear of the one who is in authority? Then do what is good, and you will receive his approval, 4 for he is God’s servant for your good. But if you do wrong, be afraid, for he does not bear the sword in vain. For he is the servant of God, an avenger who carries out God’s wrath on the wrongdoer. Therefore one must be in subjection, not only to avoid God’s wrath but also for the sake of conscience. For because of this you also pay taxes, for the authorities are ministers of God, attending to this very thing. Pay to all what is owed to them: taxes to whom taxes are owed, revenue to whom revenue is owed, respect to whom respect is owed, honor to whom honor is owed. SPHERE 5. Church: Heb. 13:17 Obey your leaders and submit to them, for they are keeping watch over your souls, as those who will have to give an account. Let them do this with joy and not with groaning, for that would be of no advantage to you. Matt. 23:1-3 Then Jesus said to the crowds and to his disciples, 2 “The scribes and the Pharisees sit on Moses’ seat, so do and observe whatever they tell you, but not the works they do. 1For they preach, but do not practice. Which authority by employers is not seen as absolute – for in each passage, the employer’s responsibility before God and giving an answer for how they exercised their authority is noted. SPHERE 7. Conscience: Acts 23 & 24 – Paul notes how he was very careful not to violate his conscience. Rom. 13; 1 Cor. 8 & 13 address people not violating their consciences, since it appears the conscience – however marred, is left over from our being created in God’s image and having an innate sense of right and wrong – which passages also show the conscience can be informed and improved. SPHERE 8. Self: Authority over self or what is better known as – Self-control. This in fact is where we will come back to in the 2nd session. For in our redemption, the chief place of restored order and authority within the human being is in this area: Having authority restored over self. Thus Gal. 5 – S/C is a fruit of the indwelling Spirit. There may be a few other spheres such as is hinted at in 1 Cor. 15:24 & Eph. 1:21; 3:10; 6:12 etc. – Angelic orders with which we have nothing to do. These spheres of authority overlap in places. Living in godliness will require our thinking through how this works – and ordering our lives accordingly. For instance: A man has authority over his wife – but not absolutely. She has a primary responsibility to God’s authority OVER her husband’s, as do children over their parents and people in general above the State. Acts 5: saying, “We strictly charged you not to teach in this name, yet here you have filled Jerusalem with your teaching, and you intend to bring this man’s blood upon us.” 29 But Peter and the apostles answered, “We must obey God rather than men. Daniel 1:8 But Daniel resolved that he would not defile himself with the king’s food, or with the wine that he drank. Therefore he asked the chief of the eunuchs to allow him not to defile himself. 9 And God gave Daniel favor and compassion in the sight of the chief of the eunuchs. Hanaiah, Azariah & Mishael refusing to worship the image. None can usurp outside of their own restrictions. No one has the authority to require you to do something God specifically forbids in His Word, nor forbid anything He requires. No circle of authority is absolute but God’s alone. All others are derivative and limited. 2. In those places where WE exercise authority over others – it is to be done with the eternal good of the person(s) in mind before God – not according to our personal desires. it is not arrogant [SO IT IS NOT ] rude. 6 it does not rejoice at wrongdoing, [BECAUSE IT] rejoices with the truth. This is the nature of Love – love seeks the best of the other party before God – not for our own pleasure, or according to our own whims. We want them to see, know, and if at all possible experience the goodness, grace, mercy and lovingkindness of God through us! For we can give no other person anything higher than to give them the blessedness of God Himself. We lead them to HIM – not to our own desires. This will temper what spouses require of each other, what employers require of employees, what Church leaders require of congregants – etc. 3. God’s main way of exercising authority is via persuasion. He publishes His clear and unambiguous will via The Word! And then, through His Spirit to work in the heart and mind to incline us toward what is better. INCLINE – not FORCE. 4. What happens when we do not function within the order God has created? The Fall: And such “falls” always incorporate 2 aspects of violating God’s order of authority. Refusal to submit to God’s authority. “Eve took” – Neither Adam nor Eve took their rightful place over the serpent – but took their cue from him instead. Christ saves us in part, to reverse these very things. And so it is worthwhile to ask ourselves – Where it is we refuse to submit to God’s authority and authority structures in our own lives? And where is it we might be abdicating our own derived authority in our sphere? Wherever either or both – and I would argue you cannot have one without the other – you will have chaos, disorder and destruction. But there is one area which first and foremost God graciously calls us to recover a proper authority structure which will inform all the other spheres in which we function – and that will be the subject of my next session.